It is called Skeinforge_Chamber rather than just Chamber to avoid possible future name collisions with the rest of the wiki. It has a Previous, Next & Contents group on the top and bottom of the page to aid navigation through the skeinforge manual. The previous link points to the previous tool in the manual, which for chamber is currently carve, the next link points to the next tool, clip. The contents link point to the skeinforge contents page. Otherwise, the chamber page follows the format of the contents page, with a heading for each setting. When adding new tool pages, please add it as a separate page using the chamber page as a model. For people who want to help develop the manual, please move existing pages to their own separate page, using the chamber model. Before each release, I will update the tools which have a separate manual page to add a manual page link to their help menus. 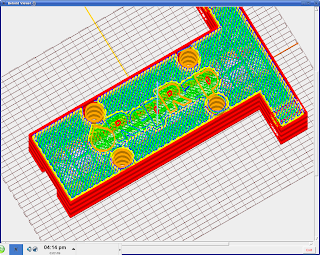 The Chamber tool has been added, to send temperature settings to a heated bed or chamber. The 'Temperature of Bed' preference sets the temperature of the bed by sending an M140 command, the default is 60.0. The 'Temperature of Chamber' preference sets the temperature of the chamber by sending an M141 command, the default is 30.0. In my opinion, it is a brilliant design. The best thing about it is that the components it uses, kapton tape and heater wire, are already on the reprap parts list, so reprappers might already have them and if they don't they'll able to order some easily. I don't know if the tape and heater wire can be added to existing acrylic or MDF beds, but hopefully someone will try it out. The 'Infill Perimeter Overlap' setting in inset has been moved to fill. The 'Extrusion Width over Thickness' setting in inset has been moved to fill and renamed 'Infill Width over Thickness'. So you'll have to reenter those settings in fill when switching to this version, if you have changed them from the defaults. Here are links and information about skeinforge. Any questions, suggestions or comments about skeinforge should be posted at this blog.